As you probably have guessed by now, I LOVE taking and sharing photos. Do you know the saying “A picture is worth a thousand words”? Well I think that it goes beyond words, pictures also evoke a wide range of emotions too. We take pictures of our families to preserve memories. We take pictures of important events in order to document them, share them and to revisit them in the future. Sadly, in the last 5-10 years, with the advent of digital cameras, we don’t print our photos much any more. We post them online, download them to our computers or leave them on our digital devices. We lose something by not printing and creating a tangible “thing” that we can pull out and looked at. The scrapbooking world hasn’t helped either. We see simply printing a photo as not enough. We feel like we are not doing it correctly if we haven’t created an elaborate spread of photos with stickers, fancy fonts and washi tape. That is sad. I would much rather sit down with a plain ole photo album than have nothing at all. Over the past few years I have gotten braver in sharing my photography in various social media outlets. It was hard at first but now I enjoy it and try not to miss a day during the week. Sharing is fun and the feedback I get back on what people like is rewarding. Plus I have found that it is a way I can encourage and uplift someones day. That through my photography I can create a moment of beauty, a moment of seeing the wonder of God’s creation. That is a blessing for me too! A few years ago I started creating handmade books of nature photography paired with a friends favorite scripture verses. She loved it! It next became a Kindle picture book and this year grew into a printed version of the book with a companion journal. I mention this to share with you the power of the pictures you take. But taking the picture is only the beginning and sadly is where most of us stop. A small journal where you chronicle your own journey and create something just for you. Maybe something you can pass on to the next generation. Your journal does not have to be elaborate. It can be a simple album with pockets for 4×6 prints. Put a picture on the left and an index card with notes about the picture on the right. It can be a journal where you add a picture to the page and simply hand write a story about your day or about a memory you don’t want to forget. It can be as fancy as you want it to be. But, I do find that the fancier you try to be the less likely it will get done. Keep it easy to access and add to. But, do document your life in photos. Write down experiences and become a memory keeper. Most of us prefer to be behind the camera instead of in front of it. If you are the photographer in your family, the one everyone grumbles about at family events and the camera comes out… I bet that when you look through your collection of photos, you are not in many of them. We all need to be better about including ourselves in photos. Of preserving our stories and not just the stories of others. We need to learn to be more comfortable in front of the camera. So here is my challenge to both you and me. 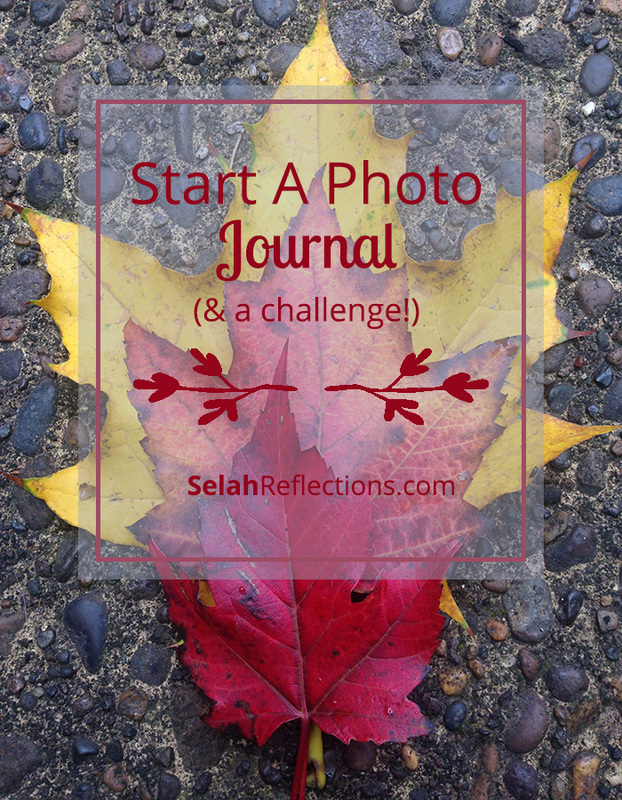 During the month of November, start a photo journal. Commit to taking AND PRINTING one photo per week and write about what you are thankful for. Take a picture of your journal page and post it on our Facebook Page, share it on Twitter, or Instagram with the hashtag #MyPhotoJournal. JUST ONE RULE… you, yes you, need to be in at least 1 of those weekly photo journal pages. Okay?! It’s such a blast going back through old photos. There really is nothing like the real thing (meaning a “real” photo–which is funny, since even a “real” photo is a representation of real life), much like a real book. So as awesome as digital photos are, don’t neglect the analog ones, I guess, is the moral of the story. With digital it is easy to take 3 or 4 versions of the same photo. Which is great! But it sure adds up fast, the amount of photos we have available to us. That number can quickly become overwhelming to deal with. With film cameras you had to be picky about what you took and then in order to see it you had to print it. I kinda miss those days. There is nothing like getting a pack of printed photos, going through it and recounting the stories that goes along with each one.